It's the last day of the workshop and everybody is tired. But there is still work to do and thankfully people are doing it. 1. Bacteria have 4 phases in their growth cycle - lag, log, stationary and death. The best phase to use is the log phase in which optimal growth takes place. The fact that we were using bacteria plated 3 or 4 days previously meant we had missed this phase. 2. 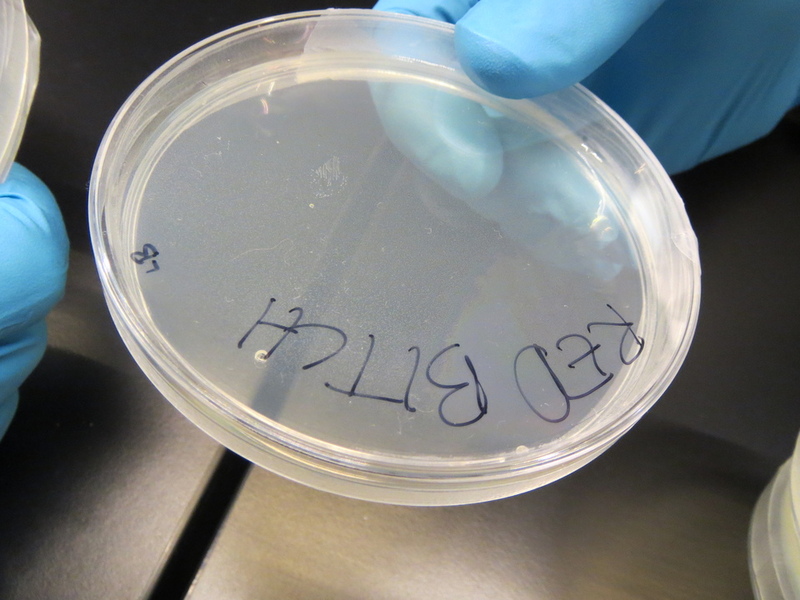 Due to variations in plasmid length, strain characteristics and protocol, not every bacteria strain is competent to take in the every type of plasmid. We used a strain not suggested by the kit and paid the price. 3. Maybe we didn't add enough bacteria to the transformation buffer, this reducing the chances of success. 4. 24 hours is usually regarded as the minimum time to see meaningful results, and we observed them after only 16 hours. A question we should maybe put to ourselves is whether, in the working environment and goals we had, knowing and practicing a protocol is more important than seeing success of that protocol. 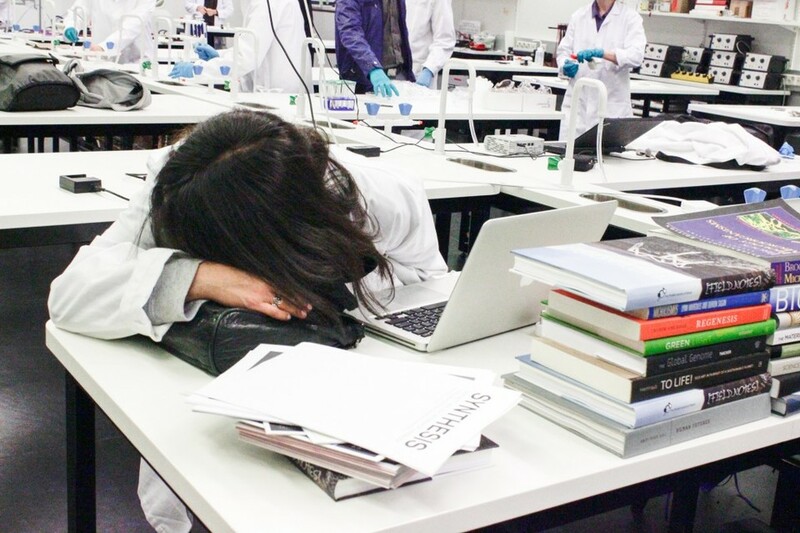 Is knowing through doing more productive than knowing by seeing? Next up is part two of the work with restriction enzymes with Paul Vanouse. The DNA itself is quite light and will generally float up out of the wells within the electrophoresis gel. To avoid this we add 2µl of loading buffer into each of the four vials; the uncut lambda DNA and vials A, B and C which contain the up to now unknown restriction enzyme. The loading buffer serves two purposes; one being to add a blue dye which makes the DNA more visible, and the other is to attach heavy sugar molecules that will serve to make it sink down into the wells. It is also a good idea to centrifuge for a few seconds to make sure that this tiny amount of liquid is all down at the bottom of the tube. The tubes are then warmed at 65º for 5 minutes in the water bath before being put on ice until ready to load. There is a large gel with 32 wells in two rows of 16 already set up. It would have been interesting to go through the process for making a gel but time restrictions don't allow us to do every step ourselves. 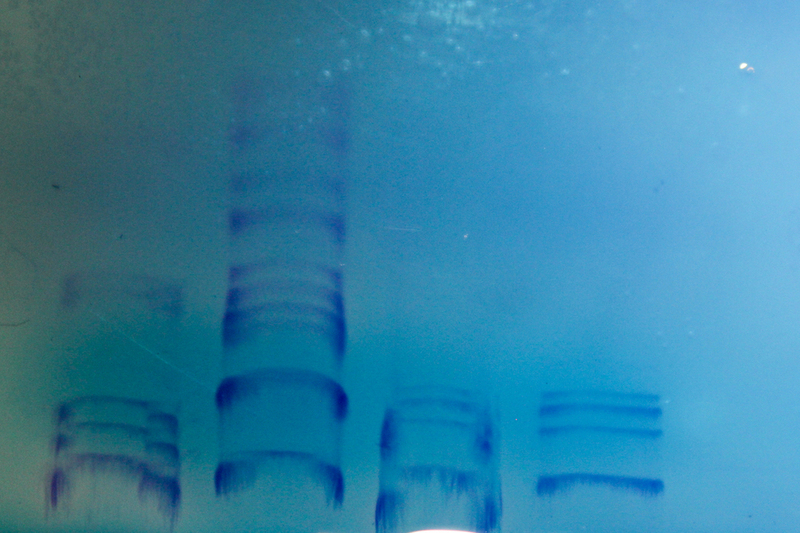 This link explains the fairly simple process quite well: http://www.scq.ubc.ca/the-macgyver-project-genomic-dna-extraction-and-gel-electrophoresis-experiments-using-everyday-materials/ In fact, it gives a nice overview to the whole DIY electrophoresis approach. Another important step is to get the bubbles out of the wells, and this can be accomplished simply by rubbing and tapping your gloved fingers across the tops. Those that have never pipetted DNA into the small wells in a gel before, and those that wanted to brush up on their technique a little, spent a few moments poking around the gel with a pipette tip. Paul emphasised that at this stage of the game sterility was not so important as it's the last part of the process. After loading the first two lanes with pure lambda and a marker sample - which basically serves as a 'reader' against which to compare our own lanes - each group pipetted their 3 samples into 3 lanes and tried to remember which was which. Its good to work quickly as the DNA, even with the loading buffer, tends to begin to float up out of the wells quite soon. After solving some issues with electrodes, connecting wires and an incessantly beeping power supply the gel was run at 100V for a minimum of 40 minutes. The voltage is proportional to the time it takes to run a gel - more voltage is faster and less voltage is slower. A protocell (or protobiont) is (according to Wikipedia) "a self-organized, endogenously ordered, spherical collection of lipids proposed as a stepping-stone to the origin of life. A central question in evolution is how simple protocells first arose and began the competitive process that drove the evolution of life. Although a functional protocell has not yet been achieved in a laboratory setting, the goal to understand the process appears well within reach." We saw videos about work by techno-fetishist futurists such as Rachel Armstrong and Philip Beesley which show how they have worked with them, and how they see them as a key to artificial cell construction. Next we play. Using a range of chemicals including ink, water, sodium chloride, gelatin, canola oil, olive oil, mineral oil, hemp oil, washing soda and baking powder we carefully pipette small amounts of each into petri dishes to observe whether or not 'cell like' persistent bubbles would form. For inspiration and entertainment we had a VJ feeding us videos of chemical reactions and theories of the origins of life. We all interpret these in the best way we see fit. 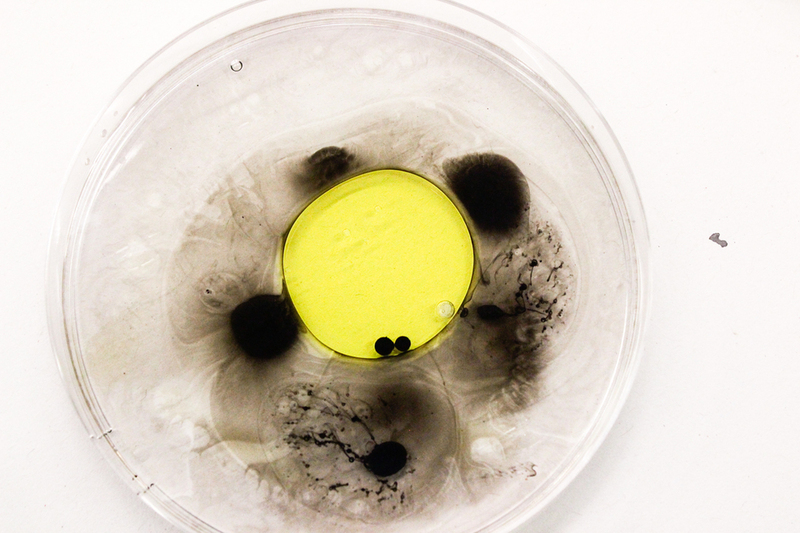 Some interesting patterns, colours and tensions in interactions appear in the petri dishes. But do we actually generate membranes? What are we really making here? On checking the gel the problems we had in getting it running are evident. Some of the DNA had escaped and the gel had not run for the optimum time. Nevertheless we had well defined ladders for each of the enzymes and Pei showed us how easy it was to work out and visualise the cuts using Sublime Text. A is HIndIII, the 12 cuts in B identify it as PstI and lastly C is ecoRI. The suspects were identified. So here's a moment that we never had chance to give the ethical discussion it deserves. If you play with living matter, when play time is over you have to kill it. Death is by cleansing with alcohol and autoclaving. When the work is done the lab should return to the state in which it was before - biowaste in the biowaste bin, equipment washed and stored, and surfaces wiped down with ethanol. The biowaste bag is then taken to the autoclave which is basically a scaled up pressure cooker with a digital display and buttons that beep. The same principle applies, the pressure within produces super heated steam which kills living matter in a few minutes. Everyone is very excited watching billions of organisms being put to their deaths. Thierry talked to us about viruses, both the organic (and the discourse on whether they are alive or not) and the digital (and those who make them). And he introduced ideas of 'Venter capitalism', viral ideas, the blurring of the boundary between viruses and cellular parasites and symbionts. We heard that considering viruses as dead or alive has long been a matter of taste, but that current thinking leans towards them being alive. They are also now being considered as 'essential agents' within the roots and stem of the tree of life, and that their genetic volatility is an essential precondition for life. Finally he introduced us to the disconcerting ideas of hackers such as 'Second Part to Hell' who are moving into creating hybrid biological and digital viruses. Helena spoke of her interest in creating video games for science and education. She has been working with scientists, designers and programmers to create web based, open source, adventure games such as Hero.Coli in which players solve scientific problems. The game taps into the idea of citizen science, helping people to understand the science behind what they are doing. She made reference to several citizen science 'games' that are already out there such as Fold It, Eyewire and Phyla. Georg began by talking about his Common Flowers project in which he and his partner Shiho Fukuhara have reverse engineered a type of carnation that was already the result of genetic manipulation. A recent evolution of this project is White Out, in which they attempt to remove the gene that produces the blue colour and return them to their natural state. The key, and very interesting, question at the heart of these works is that if we genetically modify an organism to reverse or cancel the effects of genetic modification, is it still genetically modified? He went on to present his ideas about DNA as code and the notion of the Hello World program which led onto ultimate machines (whose only function is to turn themselves off) and the phenomena of the virtual Japanese superstar. Pei introduced us to the Taiwanese BioArt Community which has been operating since 2010. The community has been running regular workshops and events on their own and in collaboration with international colleagues and associates such as Spela Petric, Lifepatch and Hackteria. 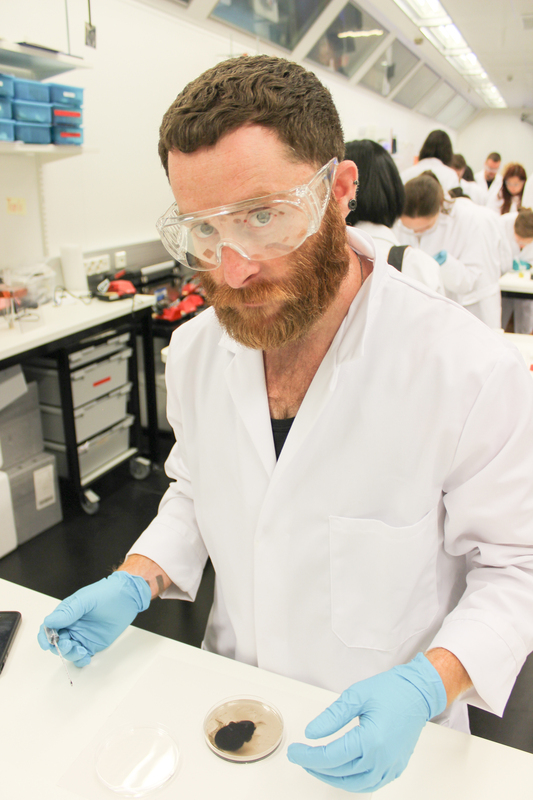 Their workshops include techniques such as bacterial culture, plant tissue culture, DIY electrophoresis and more food related activities such as wine making and sticky tofu making. The food and kitchen aesthetic and methodology carries over into much of their workshop set-ups where easily available kitchen supplies and ingredients are transformed into temporary laboratories. 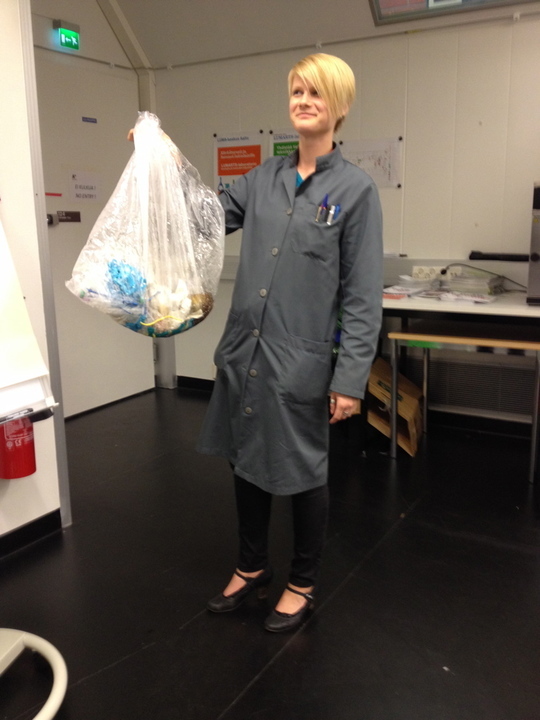 A brief interlude took place at this point as Marika proudly displayed the inert and lifeless bag of waste freshly emerged from the autoclave. Sruli presented to us a prepared discourse about product, interaction and fashion design. His focus is very much on narrative, the story behind the materials and how this meshes with our own dreams, aspirations and expectations. The narrative is key for him, and provides the way into the consumer's subconscious. Design is a game of seduction and persuasion, and the more compelling the story, the more invested is the client. Emotional responses stimulated by a sense of the uncomfortable is a deep interest of his. Pia told us about Koli National Park in the North Karelia region of Finland and discussed the idea of what is untouched nature. This landscape is important for Finnish culture and artists and painters have contributed to the construction of the Finnish romantic image. Her activities in this space have explored the idea of walking lectures, or the lecture as walking. More recently she was there with current Biofilia artist in residence and Making_Life participant Paul Vanouse making an experiment with PCR sauna. PCR is the process by which small DNA samples are amplified using a long and regular process of heating and cooling cycles. This experiment is probably a world first but unfortunately at the time of writing the results are not in. Gaze also from 2013, in which a feed from a camera in an exhibition space or the spectator's mobile is altered with a custom application to mimic the way how an animal is seeing the visual world. Body of Water also from 2013, a collaboration between Jaakko Mattila and Antti Tenetz - uses sensory feeds, living samples, environmental sensors, DIY microscopes and pre-recorded visuals from the artists´native Finland and across Europe to produce an interactive experience highlighting the connection between the individual, community and water as a vital life source. Finally it was time to close the meeting/workshop/encounter/happening and look to the future. More specifically November 2014. We move away from the basics covered in this episode and look towards more complex ideas and practices around xeno- and exobiology. We also heard many state their desires to include more discourse on our roles and artists and scientists both as practitioners and collaborators. Above all was a call to make more time for the discussion of ethics in relation to what we are doing. And then we were gone….